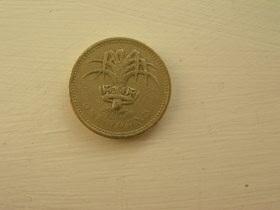 The symbol of the leek is used on some British pound coins. I wonder if vegetables appear on any other currencies? Check out the Mouse and Trowel award nominations. I'm one of the nominees for Best International Blog. Vote early, vote often! You'll find lots of other categories - Best Gardening Podcast, Blogger You'd Most Like as a Neighbour etc. 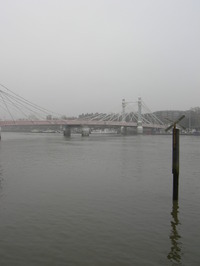 You may have read, seen on the TV news or heard that Heathrow airport is fogbound. Here's a pic looking west. I'm sorry for the travellers stuck there trying to get home for Christmas but living under the flight path this is great news. I woke up this morning to an unreal silence - no aircraft noise. The Stern Review on the Economics of Climate Change, predicting environmental apocalypse if we don't act now, is big news over here. With everyone being urged to do their bit (how many are doing so in India or China, I wonder?) when will the frickin' water companies in the south east lift the hosepipe ban so I can water my additive free, almost zero food mile veg and do my bit?! Its galling to know that I can power wash my patio and fill a swimming pool, if I had one, but it's a no no to water the garden with a hose. I should have guessed - it's a pig - when I saw it being built for the Thomas Kilpper exhibition PIG IS BACK at the Pump House Gallery. I was pretty skeptical about the allotment that went with it and the promise to feed everyone who came to the exhibition. Either the frost was going to get it or the vandals sooner or later. But you'll see from the pic that its doing well . And it was then I saw this notice . Free entry and free food - a winning combination. The leek and potato soup was very tasty and the baked potatoes still warm. If I'd been half an hour later then the scones that were being prepared would have been straight from the oven. Just where they fit in with the allotment theme I don't know but I'm sure they were delicious. Hats off to him - the allotment survived and the visitors are being fed! The exhibition closes on 29th October. If you're in the area drop by - maybe you'll get a free lunch. Sadly no pork products. Oh, yes and the publicity blurb says he "makes allusions to the present situation in Iraq." Covers some ground this man. 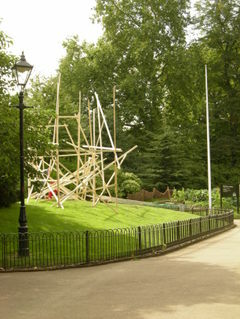 Well, work is underway on his installation in the foreground next to the allotment. There's a clue in the title of his exhibition PIGISBACK, apparently. 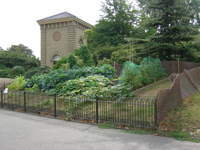 This allotment is unusual as it's in a public park, Battersea Park, south London. The work of German artist Thomas Kilpper his exhibition 'War, Pigs, Pop and Other Potatoes' takes place at the Pump House Gallery in October. According to the publicity material the organic allotment and a giant sculpture of a pig (to be made) references the Park's use as allotments and a piggery during the WWII. The exhibition will also include a sound track fusing Pink Floyd and popular WWII songs. Floyd's album Animals featured a flying pig hovering over Battersea Power Station. The ground floor of the gallery will be turned into a kitchen and food prepared from the harvest will be served to all. 1. The allotment is maintained by Wandsworth Council Youth Offending Team. Is it a coincidence that it's not been trashed? 2. It's not big and I'm not sure there's going to be much to harvest in October - I'd get there early if you want some food! 3. How do you fuse Pink Floyd and WWII war time songs? The words of We'll Meet Again to the tune of Shine On You Crazy Diamond? Vera Lynn on acid? 4. What would Syd Barrett make of all this? Can guerilla gardeners transform Britain's inner cities was the theme of Costing The Earth broadcast on BBC Radio 4 last Thursday evening. The programme follows a group of guerilla gardeners ' out to make the city green one leaf, one plant at a time and joins them as they get all tooled up to weed the filth from the streets'. An entertaining and inspiring programme! "If supermarkets were to stop rejecting vegetables that are the incorrect shape and size, what would then be available for the organic shelves?" "Why haven't the weeds in my garden withered in the heat, like the rest of my plants."